We provide versatile types of Carbon Brush Holders and many more items having standard quality and high efficiency which are manufactured by our team of engineers and other skilled and unskilled work forces. We are specialized in making best quality-approved packing under the guidance of our reliable Engineers within affordable prices with on time deliveries. Working of Carbon Brush is heavily dependent of a good quality Brush Holder. A brush holder make accurately enables carbon brush to work properly against moving slipring/commutator without vibrations or other non-friendly movements. With the constant support of our expert team, we are engaged in offering a huge assortment of Carbon Brush Holders. These brush holders are used on large industrial motors. 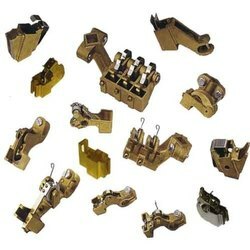 Our holders are widely used with carbon brushes in almost all types of electric motors. Our brush holders are made from metals, plastic or even some times in Bakelite.